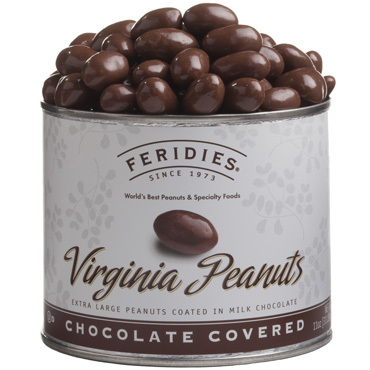 FERIDIES® offers a variety of gourmet peanut candies that are sweet, crunchy and mouthwatering! 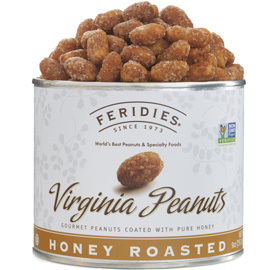 As wonderfully luscious as FERIDIES Virginia peanuts are, there are times when one hankers for something sweet. That is why FERIDIES offers a delightful variety of peanut candies with just the right blend of sweet, salty, and crunch. We have such traditional treats as honey roasted peanuts, peanut brittle crunch, and chocolate-covered peanuts. However, FERIDIES takes these traditional candied nuts to a whole new level of extraordinary quality and flavor. First, we have Peanut Brittle Crunch - select peanuts embedded in a smooth, rich buttery candy. We offer a traditional brittle candy and a brittle drenched in luxurious milk chocolate. We also have Honey Roasted Virginia Peanuts, where we roast our Virginia peanuts in a light honey coating that provides just the right amount of sweetness. For a very special treat, we offer our Virginia peanuts generously covered in milk or dark chocolate, and our delightful homemade Peanut Brittle coated in pure milk chocolate. Please note our chocolate has no chemicals to prevent it from melting at warm temperatures. Thus, to insure our chocolate products arrive in perfect condition, we ship only during the months of October through April (including the all important Valentine's Day in February) when we can be confident the temperature won't be above 74 degrees here in Virginia and at the destination. For those who have special dietary considerations, our Honey Roasted Virginia Peanuts are OU Kosher Certified and Non-GMO Project Verified. 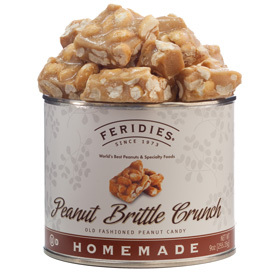 Whether for your own snacking pleasure or to delight a friend or family member with a very special gift, you cannot do better than a thoughtful selection from one of FERIDIES wonderful peanut candies.